No doubt, Cards Against Humanity has become a massive success among college folks and the party crowd. It's a behemoth among tabletop games. In the process, it's exposed millions of casual partiers (who might otherwise only play beer pong, quarters or Angry Birds) to the fun of board games and card games. This is a huge side of the resurgence of tabletop games! BUT, for the average person, taking a step from Cards Against Humanity straight into a world composed of strategic fantasy games and poorly-designed, beta and/or "experimental" indies can be a lot at once. There are a lot of crappy games out there (especially in the "party game" genre) and buying new games is an expensive investment. That's why new fans of Cards Against Humanity who are looking for games just like it should start here. I've put together this resource for Cards fans looking to broaden their palette and see what other fun can be had in the party gaming category. Clearly, having a party game of my own makes me a little biased in assessing the best games similar to Cards Against Humanity. I see it TOTALLY differently. In the process of developing Deck Around I did a ton of research on similar board games -- lots of playtesting, lots of analysis and most of all, I read lots of reviews. I wanted to know: What do people care about when they play a party game like Cards Against Humanity? What are they looking for in the design, the gameplay and the concept? Other tabletop games have nailed it as well. So, let's check them out too. I truly, truly believe that anyone who enjoys a game like Cards Against Humanity will have as much fun -- if not more! -- when they play Deck Around. The biggest benefit of Cards is how hilarious it is. Deck Around is just as hilarious and in all my testing it has exceeded Cards Against Humanity in the laughter department (people crying uncontrollably, friends riffing and cracking each other up mid-game, everything). Someone selects a word and everyone in your group writes a made-up definition for the word -- one that sounds convincing enough to be real. All the phony ones get mixed up with the real one. Next, everyone gets a chance to be judge: you each pick the definition you think is real. Then, the true definition is revealed to everyone. If you tricked someone into believing your made-up definition, you get a point for each of those fools. Everyone who guesses the real thing also gets two points. Cards Against Humanity is a "dirtier" or more party-oriented version of Apples to Apples. Similarly, Deck Around is the more-party version of Balderdash. Get it or try it free here. The Balderdash "formula" is ancient -- it actually dates back to the Victorian era when the parlor game went by the name Fictionary or Dictionary Dabble. People used their enormous unabridged dictionaries, picked an obscure word, bluffed definitions for it and assigned points based on who guessed what (if you skipped down to here, see the Deck Around description above). Beyond Balderdash applies that same formula to more categories: random dates, weird acronyms, not-so-famous names and (most fun of all) obscure movies. The bluffing part changes for each category. For instance: in the movie category, you bluff the plot summary; in the names department, you bluff their biggest accomplishment. This version of Balderdash is definitely more accessible because it depends less on your knowledge of Latin and your ability to write like a dictionary. The problem is that there's no real inherent immaturity in Beyond Balderdash like in games like Cards Against Humanity and Deck Around. In fact, as the night gets later, your friends will start to write weird responses just to hear them read aloud by the Dasher... which is hilarious! They totally should do that! I mean, why would you play a less-hilarious version of a board game? The problem is that the mechanics fall apart a little when people get slap-happy. If you've played Deck Around and Cards Against Humanity, you should definitely try Say Anything next. As far as widely-produced party games go, it's pretty much the closest thing in tone and similarity to the other two. First, the judge asks a question from a card.... like, "What's the worst movie of all time?" Next, everyone writes down an answer that they think the judge will pick. It can be a ridiculous made-up answer (like, "A chick-flick starring Adolf Hitler"). The answers are unveiled and the judge secretly chooses and commits to his selection on a hidden dial. Finally, everyone bets with tokens on which answer they think the judge chose. Did you follow that? It's definitely a little hard to explain and it can take a few rounds for people to get a feel for it. This is the main "con" of Say Anything: the rules (and scoring) are confusing and frankly the whole betting process feels convoluted, making it less similar to Cards Against Humanity. Say Anything is probably my favorite party game and if you like Cards Against Humanity, I think you'll dig it too. This may just sound like a strange set of constricting rules but it actually makes the game so much more fun than traditional charades and Ellen's Head's Up app. Because you're (sometimes) covering the same titles in each round, you can make reference to a previous round's antics to help your team guess the current round's title. Basically, you're "calling back" to something in an earlier round -- but you're restricted in how you can do it -- and this pretty much triggers instant laughs (much like a stand-up comedian might "call back" to a previous joke). On-the-fly, the game encourages you and your team to up with your own "inside jokes" and silly references to propel future rounds. Because the game makes you come up with creative presentations of titles and interpret them to get the right answer, it works the same brain muscles as Cards Against Humanity. And naturally whether this process fails or succeeds you and your friends will be laughing like during a game of Cards -- just with more energy, since everyone is more active. There are definite downsides compared to Cards Against Humanity, though. The multiple-round twist in Time's Up makes it much more confusing to learn and get used to so the game sort of fails in the "easy to learn" department. Time's Up's twist on charades is also a lot easier to get into than traditional charades -- it's much less "embarrassing" and it encourages shy folks to play ball. But by virtue of the fact that it's a charades-style game at all, many friends will put the kibosh on even attempting to play and could have a negative outlook from the beginning -- which can kill the mood in any party game. This is one of the reasons that it's nice for players to "hide behind" the cards in Cards Against Humanity. Lastly, the titles (and the celebrities, in the original version of the cards in this game) are kind of lame and sometimes too obscure for folks to have fun with or even be familiar with. I think a snarky CAH version of the cards would introduce a lot more fun because right now, it's designed to be more family-oriented. Dixit -- Dixit has a very similar "how well do I know my friends" and bluffing characteristic. It's fun. However, I've rarely really seen a round of Dixit get "hilarious" like a game like CAH. Wits & Wagers -- Say Anything is actually created by the same folks as Wits & Wagers. It's very similar and it's fun, but it's based a little more in trivia. And the scoring/strategy reminds me more of something like The Price is Right than Cards Against Humanity. Again, this game has some bluffing and table talk but it's not necessarily going to have you ROFLing. Telestrations -- Telestrations is basically a fusion of Telephone and Pictionary. It's based on another immature party game called Eat Poop You Cat... except Telestrations is very family-oriented, which dries out all the hilarity. Thanks for taking the time to read through this guide to similar games to Cards Against Humanity. I've had a ton of fun playing all of these games and putting this together. I'm sure that if you try just one game from the list, you'll enjoy it -- they're all top-notch! 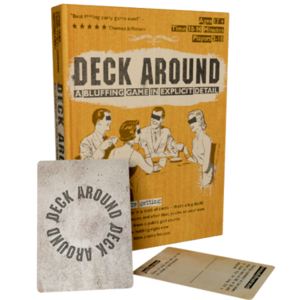 To start, you can get a free demo of Deck Around -- I'll email it to you if you drop in your email address on this page. Of course, you can also go there to buy the real thing. Enjoy!